Global Security Glazing provides Armor-Gard™ bullet resistant products for protection against a wide range of ballistic threat levels. All Glass products combine multiple layers of glass and polyvinyl butyral (pvb) with “no spall” protection and UL Listings for various levels of protection. Secur-Tem + Poly® products combine the durability and abrasion resistance of glass on the “attack” side and the impact resistance of polycarbonate to the “witness” side, providing thinner and lighter products with “no spall” protection. LEXGARD® products combine polycarbonate with polyurethane interlayers to achieve various levels of ballistic threat and extensive attack resistance. Exposed polycarbonate surfaces are abrasion resistant for maintenance. LEXGARD® products can be manufactured as Air Gap (AG) units combining low maintenance laminated glass with the impact resistance of laminated polycarbonate for UL Listed “no spall” protection. 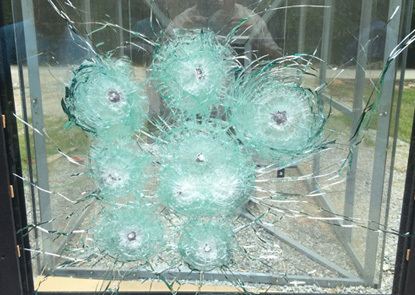 Advanced Transparent Armor (ATA) products contain glass, polycarbonate and a proprietary polymer, which offer a lightweight solution while providing high levels of ballistic resistance. Our Single Responsibility program covers all of our products. The charts below provide a quick reference for product choices.